Just when it seemed the Panthers season might as well have been put to rest, the club pulls you back in again. Cam Newton and the Panthers did all they needed to do in the first 8 minutes Sunday, putting up 17 points and putting on a defensive show in holding the Saints to 10 points in a 41-10 win in New Orleans. Newton dominated the Saints with three touchdowns, and then appeared to incite a scuffle when he dived over the pile for another score. 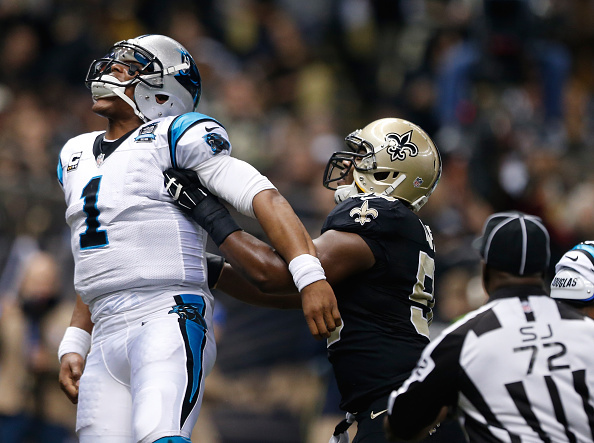 The fight after the TD that made it 17-0 started when Newton did his ‘Superman’ pose and then Saints linebacker Curtis Lofton drew a personal foul for shoving the QB. Jonathan Stewart added a 69-yard touchdown run as the Panthers (4-8-1) pulled closer to NFC South leader Atlanta (5-7), which plays Monday night at Green Bay. Newton’s scoring passes went for 9 yards to Kelvin Benjamin, 16 yards to tight end Greg Olsen and 26 yards to running back Fozzy Whitaker. Newton was 21 of 33 for 226 yards, was not sacked and was not intercepted. Newton also rushed for 83 yards, but downplayed the part he played in those gains, saying the Saints left him wide open rushing lanes. Stewart finished with 155 yards rushing on 20 carries as the Panthers piled up 271 yards on the ground. The Panthers’ points total was their highest of the season, surpassing the 37 they scored in an overtime tie at Cincinnati. Carolina’s 497 total yards also were easily a season high, albeit against a Saints defense that entered the game ranked second-to-last in the NFL. Carolina scored on its opening possession for only the second time all season, driving 80 yards on seven plays, capped by Benjamin’s touchdown. Olsen’s TD gave the Panthers a 24-3 lead that stood at halftime. Boos rained down on the Saints as they trotted to the locker room, and again when they began the second half by punting after three plays. When Whittaker turned a screen pass into a touchdown to make it 38-3 with a little more than five minutes left in the third quarter, much of the Superdome emptied out.